The method involved attaching infrared sensors to the players’ bows (there were eight violinists) and the conductors’ batons (two conductors) and then tracking the relationships between the movements of the baton and the violinists’ bows and among the violinists’ bows and each other. (How asking a conductor to lead eight skilled violinists is a test of anything is beyond me, but whatever.) The idea was to measure the degree to which the violinists are influenced by the conductor and the degree to which the violinists are influenced by each other (since eight decent violinists can play just about anything—such as Mozart Symphony #40—without a conductor). Of the five pieces played, listeners were indifferent between the performances of the two conductors for three pieces. 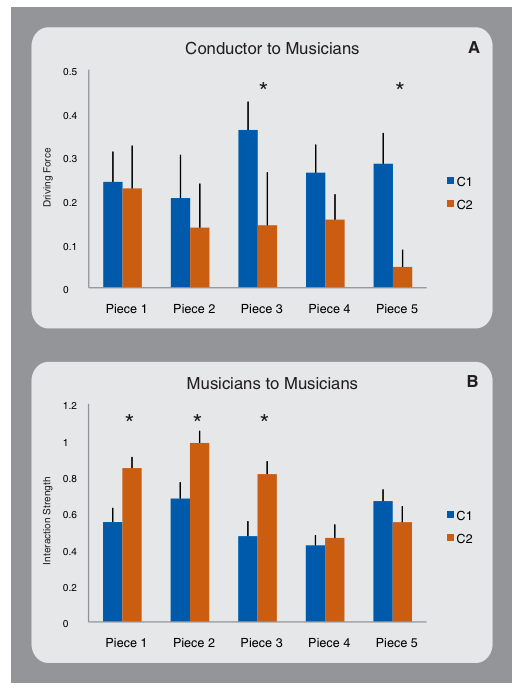 For piece #3, conductor 1 was significantly more assertive than conductor 2, and the violinists were significantly less dependent on each under conductor 1 than under conductor 2. Listeners preferred the performance under conductor 1. For piece #5, conductor 1 was also significantly more assertive than conductor 2, but this time the violinists were not significantly less dependent on each other under conductor 1 than under conductor 2. This time listeners preferred the performance under conductor 2. If you think there isn’t enough data here to draw any conclusions, you’re not alone. Alternatively, the conclusion might have been that the conductor should be laid-back rather than assertive, as that was clearly the right strategy for piece #5 (where C2 was preferred). At the end of the day, there were two pieces where the listeners were not indifferent. In piece 3, the winning strategy was high assertiveness by the conductor and modest interaction among the violinists. In piece 5, the winning strategy was low assertiveness by the conductor and modest interaction among the violinists. But research costs money, and you have to publish something to show you didn’t waste the money, so this is what we got, and then The Economist picked it up with the subtitle, “Von Karajan Was Right: Orchestras Really Can Use the Smack of Firm Leadership,” and then Tyler Cowen picked it up, and . . .
Of course, any real musician knows that this kind of study is hopeless and misguided from the start. Any good orchestra can play any piece from the standard classical repertoire without a conductor. In an actual performance, the conductor provides a modest coordinating role (which could really be played by anyone good enough to play in said good orchestra). This role, however, is superfluous when you only have eight musicians—the Schubert and Mendelssohn Octets are regularly played without conductor, for example. * In high school, I went to the Juilliard Pre-College Division, and in college and the first half of graduate school I spent most of my time playing music. Many of the people I played chamber music with are now professional musicians, most Alan Gilbert. I also conducted an orchestra for one year in college. When the whole orchestra is sitting in a way that faces the same direction, all you need is a teleprompter in front to coordinate the piece. If there was ever a “job” that could be replaced by technology – the orchestra conductor is certainly one! Once upon a time, before she was paid for her opinions, Megan McArdle took out after Derek Walcott for a poem he’d written. The substance of the poem was clearly not pleasant to Ms McArdle, but she chose to condemn the Nobel winner’s poem as being bad poetry. It wasn’t bad because he’d handled the technique’s of poetry badly, mind you, but because it did not do what McArdle claimed poetry was meant to do. For some reason, McArdle is now paid for this sort of stuff. Then there was that time David Brooks explained orbital physics. Oy! Now, we have Tyler Cohen, also in the punditry business, instructing us on the true role of an orchestra conductor at the highest levels of musicianship, based on his recollection of his school days. I realized my wish is an oxymoron, but please, let us have humble pundits. If you’re going to update the technology, why not have the orchestra use the “Guitar Hero” model? Devil’s advocate: Why would respect for the conductor influence the quality of the music? I can see how the conductor’s and musicians’ appraisal of said “respect” would positively influence the post-hoc appraisal of heir experience of both. Are orchestras so identified with their conductors that this lack of respect is expressed as bad playing on the part of musicians (to shame the conductor, perhaps?) or additional attention to detail (to demonstrate said respect, or just to please the conductor?). Annie: you still need someone to “drive” the teleprompter. By taking the conductor off stage and standing up a teleprompter, you’re only adding technology to the workflow, not replacing anything; except perhaps personality. When an orchestra plays without a conductor, we usually see the lead violinist taking this role. A conductor is also a musical director, making interpretive choices. Delegating this to the lead violinist means their own job cannot be carried out to the fullest extent. Aside from this, we often see, not just in music but in other walks of life, where there is some “benevolent dictator” who oversees a group of like-minded contributors. I would happily play under von Karajan’s smack of firm leadership. For a manager at work? Not so much. Everyone already has the musical score on a stand in front of them – so that’s all that would be on the screen – the score. Just don’t understand how the technology that can turn anyone into a presidential candidate – the teleprompter – can’t be used to turn an orchestra into an orchestra…. I have never commented in this blog, and probably will not again. When it comes to economics and finance, I am an amateur. 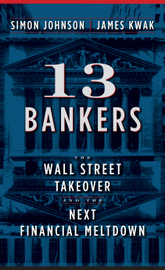 I have learned a great deal here that has helped me understand the economic turmoil of the last few years and its roots in the last 30 years or so. Here, however, you are in my field of expertise. As a professional musician of more than 50 years experience, I have performed with many orchestras, greater and lesser, as well as in many more conducted small ensembles. I have been fortunate to play under many extremely well-known conductors as well as many more little known, but not necessarily lesser artists. I think you are correct in your general premise that science has so far not demonstrated an ability to meaningfully quantify or logically describe what I will call “artistic” or “interpretive quality” in music or art in general. The role of a conductor is a complex one in ensembles large or small. The minimum requirement for a conductor is good and clear time keeping. In some music–for example, pieces with complex meter and/or temp changes, or opera, where at key points the soloists must be followed and the orchestra usually cannot see or often even hear them clearly–the role of the conductor in simple time-keeping is vital and quite difficult. In standard literature, time keeping can be done by the ensemble itself, whether it is large or small. However, the larger the ensemble the more difficult and time consuming it is to collectively come to a high level of artistry without a conductor. In a professional environment the decisions of a conductor are always paramount. This is not only traditional, it is practical, since economics(!) dictate that rehearsal time, particularly for very large ensembles is almost always much less than ideal. It does not really matter whether they are pleasant and convivial or autocratic or even nasty (rare in my experience). Like him/her or not, professionals will take the conductor’s decisions and try to give the best performance they can. Rehearsal technique is one of the most important places that the best conductors distinguish themselves. If the piece is new or unfamiliar, they use the limited time efficiently to make sure everyone is solid with the timekeeping, for only then can the artistry emerge. With all pieces, the best conductors bring a unique and inspiring vision to the music and can convey this effectively in limited rehearsal time–this is true of large or small ensembles. This quality is generally obvious to the musicians from the first rehearsal (this might be what you are referring to with the term “respect”– we may not be able to describe it in words, but we know it when we see it and hear it). To the extent the conductor does not convey such a unique and inspiring vision the musicians will fall back on their own experience and artistry to make things work as best they can. The best artistic outcomes generally come when a “respected” conductor has a lot of time with an ensemble–many rehearsals or ideally many seasons. In performance, the best conductors bring something extra to the performance, which helps raise the ensemble to a higher level than anything achieved in rehearsal. Finally, the true “assertiveness” of a conductor in performance is generally not obvious to audiences. There are conductors like Pierre Boulez whose movements are simple and economical and everything conveys important information to the musicians, yet this may seem very plain and relatively uninspiring to the audience–he consistently gets extraordinary performances from orchestras. Others, like Zubin Mehta have a technique that audiences can appreciate as an “assertive” show, and every movement is also conveying something essential in time and music to the musicians. Conductors like these are the creme de la creme of stick (or hand) technique. Most conductors fall somewhere in between. Some are very imprecise but showy yet in their style and personality are able to inspire an ensemble to great heights. Others, some with big reputations, can be imprecise and convey very little inspiration–in rehearsal or performance. I hope this can convey some of the complexity of the subject you have raised and give you an insight into the point of view of musicians (at least of this musician). I am sure some of my colleagues can supplement this with additional comments and opinions–everyone has conductor stories, both good and bad. During the tenure of Barenboim at the Chicago Symphony, as wonderfully uppity a collection of musicians as are to be found, there developed a practice of performing Ravel’s Bolero (but never, never Lil’ Abner’s) with only an opening cue from the conductor. The band made at least one quite thrilling video recording of this in concert, with Mr. Barenboim standing, hands folded, on the podium. So, no, it’s not strange at all….. I agree with this thought and believe, through personal experience, that “science” has even lost the ability to “meaningfully quantify or logically describe” itself (science can’t do science anymore because of the math). The conductor must do trwo things: 1. Give the correct tempo. 2. Create the appropriate atmosphere for achieving great results. sfox comments were the very best of all comments…based not on pseudo-science but experience and knowledge of an art form. Most can learn from this sfox response. Conductors and their musicians elicit in performance the fact that where words are insufficient to describe their work, the magic of music does.